Year two of Uproar for Darien Lake, and also for us! Pete and Jerry met up at my place, and away we went. Tailgated at the place across the street again, which was far emptier than it had been last year. Not sure quite why, but hey, more room for us. We wandered in right as Art of Dying’s set started on the side stage, and for not knowing a ton about them, they sounded pretty good. I recognized a couple of the tunes, and what I didn’t came across well. The crowd seemed to enjoy them too. Art of Dying setlist: Straight Across My Mind, Get Thru This, Best I Can, Whole World’s Crazy, Die Trying. 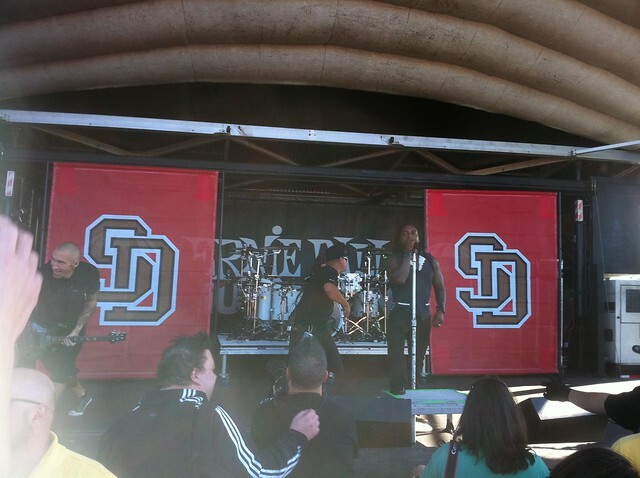 Next up was easily and obviously one of my highlights of the day: Sevendust! I meandered my way up to the front, and proceeded to jump and mosh with everyone else for the next half-hour straight. MUCH better crowd than the fools in Rochester at Music As A Weapon. No contest. These people were here for 7D, and we let the band know it. They started with Splinter, and that set everyone off. Praise and Forever were next, then it was what’s becoming my all-time favorite live 7D song, Pieces. That song just oozes energy and screaming. The End Is Coming was next, and the always-too-short set was capped off by the usual mosh-worthy Face To Face. Another 7D show, and another ridiculously fun time had by all. After extricating myself from the side-stage crowd, I found Kiersten and Pete to say hi, then headed under the tent to our seats for Escape the Fate. They were decent, generic metalcore if you ask me, not exactly main stage material. After their set I took off and while I didn’t have a wristband for it, at the tail-end of Sevendust’s autograph tent time, they made time for a handful of us off to the side. I got to briefly say hi to Clint and John, and grab a quick autograph. Always such cool guys to the fans, never fails. Back under the big tent, and Bullet For My Valentine was better than I had expected. I’d heard a little bit of their stuff, but never really checked it out in depth. I still may not, but they certainly commanded the stage and kept everyone’s attention. Seether was up next, and while this may sound like a slam, it’s not: It was a usual Seether festival set. They opened with Gasoline into Fine Again, and went from there. It was their typical solid set, heavy on the hits, loud (save for Broken), and had everyone bouncing and singing along. They were the perfect band for the middle main stage slot. Seether setlist: Gasoline, Fine Again, Broken, Tonight, Country Song, Rise Above This, Fake It, Remedy. Next up: Three Days Grace. Now, I’ve been down on these guys the last couple times I’ve seen them, mainly because I’ve never thought singer Adam Gontier’s voice was strong enough live. I’m happy to report that he proved me completely wrong this time around. He and the rest of the band sounded fantastic, and this was easily the best I’ve ever seen them. Their set was a sprint through hitsville, but they did it well. Adding a little cover of Eminem’s Lose Yourself tacked onto the end of Home was a fun ad-lib that the crowd ate up. During the closer, Animal I Have Become, some of the band members’ kids came out on stage with little instruments and were rocking out alongside their dads! Totally cute! I came away very impressed with the band this time around. 3DG setlist: The Good Life, Break, Pain, I Hate Everything About You, Home/Lose Yourself, Never Too Late, Riot, Animal I Have Become. And finally, the night’s headliners, and Uproar alums from last year, Avenged Sevenfold. I think they sounded better than they did last year (and they were great last year). Anyway, A7X apparently were asking fans on their website which deep cuts they wanted to hear on this tour, and as such they’d been mixing up the setlists a bit from night to night with some older stuff. I’m no A7X expert, but I do know we saw some older tunes that don’t normally get played (Won’t See You Tonight Part 1, Not Ready To Die, Little Piece of Heaven, etc. ), and Bat Country made it’s reappearance (didn’t get that at either show I saw last year). The stage setup was even cooler than last year, and again, the band sounded fantastic. These guys know how to bring it live. A7X Setlist: Nightmare, Critical Acclaim, Beast and the Harlot, Welcome to the Family, I Won’t See You Tonight Part 1, Afterlife, Not Ready to Die, Scream, A Little Piece of Heaven, Bat Country, Unholy Confessions.